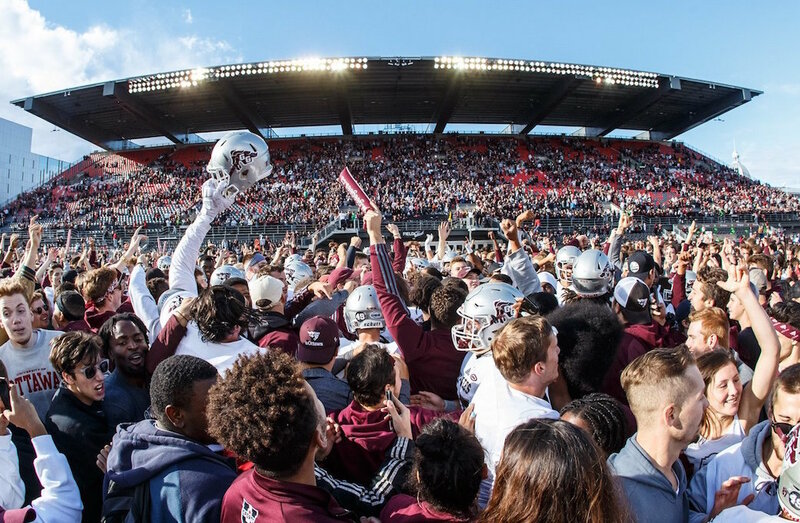 The 50th edition of the renowned Panda Game between the Ottawa Gee-Gees and Carleton Ravens took place Saturday in front of a sellout crowd of over 24,470 at TD Place, and this one had a lot on the line. Unlike last year (a wild 33-30 double-overtime win for Carleton, but a battle of unranked teams), this year’s clash had significant Top 10 implications, with the 4-1 Ravens ranked fifth and the 3-1 Gee-Gees ranked ninth heading into Saturday’s game. And this 50th Panda Game also ended with a 38-27 Ottawa win, a dramatically different result than what we’ve seen lately. Arruda ➡️ Soares ➡️ Walker ➡️ TOUCHDOWN! The Ravens looked to extend their lead soon afterwards, as defensive back Jon Edouard picked off Ottawa quarterback Sawyer Buettner on the Gee-Gees’ first drive. However, Arruda threw an interception of his own on the ensuing drive, with Ottawa’s Rashad Spooner hauling in a pass after it was tipped. That led to Buettner orchestrating a drive that he capped off with a touchdown pass to Carter Matheson, tying the score. The Ravens responded with another touchdown of their own, but the Gee-Gees bounced back with a touchdown and a field goal to take a 17-14 lead into the half. Ottawa then scored the next 21 points, aided by a fumbled punt return and by multiple interceptions, and Carleton’s attempted fourth-quarter comeback was too little, too late. For the 50th time, the #PandaGame is in the ?. On the day, the Gee-Gees’ defence particularly stood out, picking off Arruda four times and holding him to 19 completions on 34 attempts (55.9 percent) for 248 yards and a touchdown. 2017 first-team All-Canadian Jamie Harry led the way with two picks, giving him five on the year (topping the U SPORTS leaderboard). Fellow DBs Spooner and Luke Griese recorded the other interceptions. And on offense for Ottawa, Buettner completed 16 of 28 passes (57.1 percent) for 243 yards and five touchdowns with one interception, finding Kalem Beaver five times for 128 yards and two touchdowns. Buettner also added 24 rushing yards on four carries, while running back Dawson O’Dei rushed 25 times for 142 yards (an average of 5.7 yards per carry) to help give the Gee-Gees the win. POST PANDA GAME MOOD ? Regina kicker Aldo Galvan then converted the extra point, leaving Manitoba seven behind the Rams. The Bisons then scored a touchdown of their own on their own first possession of overtime when Des Catellier hit Shai Ross for a 16-yard touchdown pass, but their attempt to go for the two-point conversion and the win didn’t work out, with fifth-year Regina linebacker Cole Benkic knocking down Catellier’s attempted pass to Trysten Dyce. Bisons go for two points and the win, but Cole Benkic knocks the pass down and the RAMS WIN! The game only got to overtime thanks to an impressive fourth-quarter comeback from Manitoba, as the Bisons trailed 25-8 partway through the fourth. But they scored on their next three possessions, tied the game with 48 seconds to go, and almost won it in regulation on a punt return from Marcel Arruda-Welch before a shoestring tackle from Regina rookie linebacker Josh White saved the day. It worked out for the Rams to go to overtime, though, as that gave Picton the chance to break the record this week. All in all, Picton completed 20 of 30 passes for 296 yards and two touchdowns, and he now has 11,496 career passing yards. And he still has three regular-season games left to extend that record. Speaking of the record books, Laval Rouge et Or head coach Glen Constantin recorded his 170th Canadian university football victory as a head coach (all with Laval, where he’s been the head coach since 2001) in the No. 2 Rouge et Or’s 53-2 win over the Concordia Stingers. That put him second all-time in career wins, passing renowned Western coach Larry Haylor (169 career wins, inducted into the Canadian Football Hall of Fame in 2014). Constantin now only trails record-holder Brian Towriss (196 career wins), the famed Saskatchewan Huskies’ coach who was honored by that team two weeks ago. And this also increased Constantin's lead amongst active coaches; second there is Queen’s head coach Pat Sheahan, who stayed on 156 this week thanks to a 26-23 loss to No. 1 Western. The No. 1 Montreal Carabins have a truly remarkable shutout streak going. The Carabins picked up a 5-0 win over the Concordia Stingers Sunday, and they’ve now gone a full calendar year without allowing a goal in regulation, in both the regular season and the playoffs. The last goal Montreal allowed in regulation came Oct. 1, 2017 against the UQAM Citadins. And keeper Claudia Dubé-Trempe has been key to much of this shutout streak. Pas accordé un seul but en temps réglementaire depuis 1 an..... oui oui, 1 an!!! Les ?⚽️ sont tout simplement dominantes! Oh, and the only overtime goal the Carabins have allowed in that span came in a double-overtime 1-0 loss to the Laval Rouge et Or in last year’s RSEQ championship. Montreal bounced back from that to win the U SPORTS championship, posting shutout wins over Guelph, Trinity Western and Cape Breton to do so. 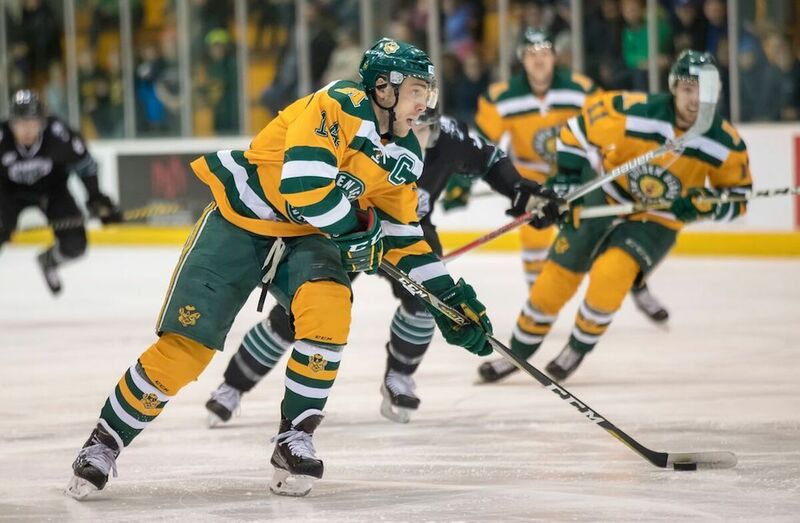 The Alberta Golden Bears claimed last year’s national championship, and they raised that banner in their season opener at home against the Saskatchewan Huskies Saturday. However, the rest of the night didn’t go so well for the Golden Bears, as they fell 5-2. The evening started off well for Alberta thanks to goals from Cole Sanford and Curtis Miske, but Saskatchewan then received goals from Kohl Bauml, Tanner Lishchynsky, Logan McVeigh, Jordan Tkatch and Jaimen Yakubowski, plus 30 saves from Taran Kozun. McVeigh’s impressive shot from a sharp angle (on a delayed penalty) would prove to be the eventual game-winning goal. The UBC Okanagan Heat are new to cross country U SPORTS competition this year after spending the last seven years competing at the CCAA level, and they hosted their first U SPORTS meet this weekend with the UBC Okanagan Invitational, a dual meet with the Thompson Rivers Wolfpack that counted as part of the Presidents' Cup Athletics Challenge between the schools. That went quite well for the home team; the Heat claimed the titles on both the men’s and women’s sides, with Mike Mitchell, Turner Woodruff and Owen Harris sweeping the men’s podium and Veronika Fagen (last year’s individual CCAA champion) and Brittany Webster taking first and second on the women’s side. Wearing orange singlets in honour of residential school survivors, @HuskiesTFCC hosted a solid Sled Dog Open on Saturday. Despite Hufsmith’s stellar showing, Calgary took the women’s team title thanks to Manor, plus teammates Kate Anderson and Emily Simpson (who finished third and fourth). Saskatchewan finished second, while Alberta was third, Manitoba was fourth and MacEwan was fifth. On the men’s side, Calgary won the title thanks to Russell Pennock, Stefan Daniel and Ryan Grieco sweeping the podium, beating out Manitoba, Regina and Alberta. That was a major contrast from the 1-1 draw between the teams Friday night. However, it should be noted that this was UNBC’s fourth game in seven days. They beat Calgary in a regular game last Sunday and beat Victoria 2-1 in a road makeup game Thursday, one that was originally supposed to be played in August but was rescheduled thanks to wildfires. But still, the Thunderbirds as a whole and Yli-Hietanen in particular looked great in this one. Elsewhere in men’s soccer, the unranked McMaster Marauders edged the No. 7 Guelph Gryphons 3-1 at home Sunday. That game was tied at 1 until the 88th minute, when Antonio Sereno put McMaster on top. Guelph tried to press for an equalizer, but Robert Tamale added an insurance marker on the counterattack soon after. And the No. 8 Alberta Bears and Pandas came up with a 3-0 win over the Lethbridge Pronghorns Saturday and a 4-0 win against the Saskatchewan Huskies Sunday, both at home. Sunday’s game saw Easton Ongaro record a hat trick and an assist, while Ajeej Sarkaria added a goal and two assists. But it was keeper Connor James who really made history, recording three saves for his fourth-straight shutout and setting a new Canada West record with his 29th career clean sheet.